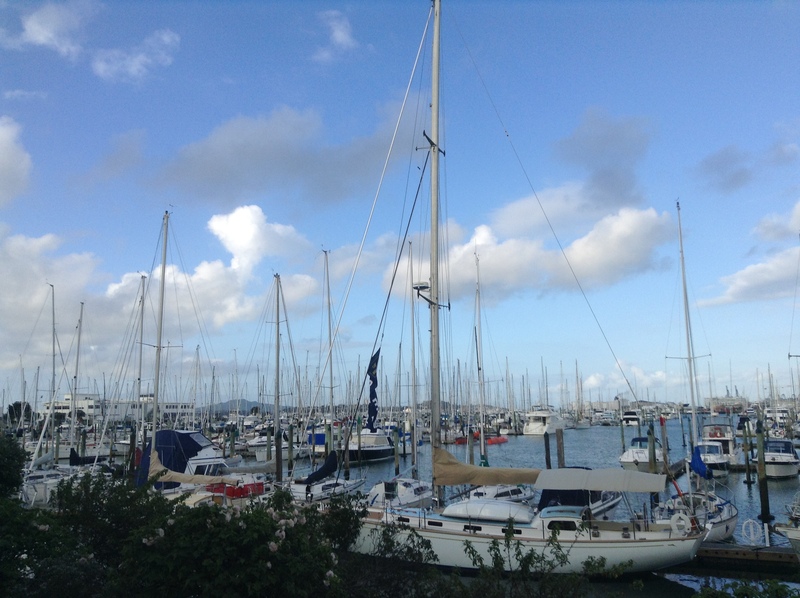 The nickname “City of Sails” confirmed during one of my runs along Auckland harbor. IT’S RAINING AGAIN IN AUCKLAND. A quilt of grey cloud has spread itself over the entire city, and from the living room window I can see the wax eyes flit about in the backyard, shaking rain drops off their tail feathers. A pair of iridescent blue Tuis perch on the banana tree, singing to one another. I make myself another cuppa tea and add a handsome teaspoon of raw honey that I purchased from the French Cafe’s bee keepers. It’s beautiful, cloudy honey, with a richness unlike anything I’ve ever tasted. In a moment of excess I told Colin that we needed 3 kilos and he didn’t put up any argument. My flatmate, watching me take a dollop of honey from our giant bucket, suggested I transfer some of the golden goodness to a smaller container. Because spooning it out of that bucket made me feel a little naughty – like a child with her hand in the cookie jar – I took that advice. On our counter we have a bag of feijoas, persimmons and mandarins from a friend’s garden. In our backyard, more mandarins are ripening and a large bunch of bananas has been cut down from our tree. They are swiftly turning yellow on our porch. Feijoas are a revelation. A small green oval of a fruit, they taste like a cross between a lemon and a pear, with a certain sweet tartness. Kiwis make all manner of things from these unique little fruits: sorbet and ice cream, cake, smoothies and alcoholic beverages like ciders. And then there’s figs. I don’t think I’ve ever appreciated the beauty of that bright green skin and deep red fruit – speckled with small seeds like tiny stars – or tasted anything like a fresh fig’s buttery smoothness. Though I miss cherries and apples from Door County trees, Central Otago produces beautiful deep red “stone fruits” in summer and apples easily ripen on trees in Hawkes Bay. It’s cold inside again and soon enough we will have to buy more gas for the propane heater we huddle around like homeless people on truly chilly days. I wear socks with my slippers; the kitchen tile in the morning is absolutely frigid, and there are few other things in this world that will wake you up faster. We have lived at 66 Williamson for over a year now, and as humans tend to do, we have started to collect things: a blender, a desk, a hand-carved John Dory fish that hangs on our bedroom wall. We sometimes reminisce about our down mattress pad and comforter at home. As a couple, we have never lived in a city of this size, much less in such close proximity to it’s thriving center. It’s a ten minute walk to our favorite watering hole – a bar we love more for its fabulous happy hour and charismatic staff than it’s ambiance. In a city full of immigrants from the likes of India and Southeast Asia, it makes sense that great little eateries are constantly popping up all over the place. 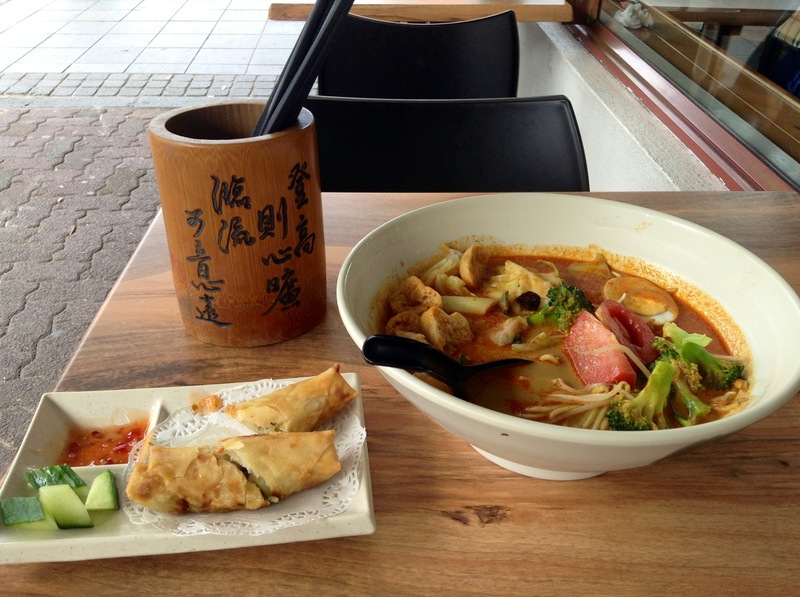 Just the other day I took Colin to a steamy, small, and very busy Malaysian joint I stumbled upon one afternoon, and was delighted by a huge bowl of veggie laksa for $14. A huge bowl of Veggie Laksa at a Malaysian restaurant in Newmarket. We have been slowly cultivating a friend circle, and we went out with some of my colleagues over the weekend. After bowling, we stopped in at a hip little bar that serves craft beer in mason jars. One of my French coworkers was chatting up the bartender, who told him she was from Ohio. He said something about us being from Wisconsin, and she replied, “Wisconsin’s almost as boring as Ohio.” When we heard the story, I had to resist the urge to go over and confront her. Colin and I both immediately got our tail feathers flustered, because it just so happens we’re proud to be Wisconsinites. Which brings me to my point: anyone who tells you they don’t miss home is either lying or doesn’t have a home worth missing. In the first case, you can hardly blame a person for denying how much they long for the land of their birth, especially when (as is often the case) it’s not feasible to go back. The second scenario is one I don’t envy, even if the homesickness sometimes drags me down. I miss jogging in the woods in September, the taste of freshly pressed apple cider, the colors in a Door County sunset, the joy of jumping off someone’s boat into the deep blue waters of Lake Michigan and yes, cheese curds. When I leave the French Cafe, they will remember me as the vegetarian-American from Wisconsin, they will remember how I talked about cheap craft beer and sharp aged cheddar and the Great Lakes – how if they visited me in my home state, everyone would say hello and then offer them a cup of bottomless coffee. Christmas in Nelson, NZ. A Townshend craft brew in one hand and a mini Christmas tree in the other. I feel myself constantly wavering between love of home and love of this little island in the Pacific. Especially on Sunday, when Colin and I hop into the Caldina and drive an hour or so (in almost any direction) before we alight at some breathtaking beach, or another piece of rugged coastline where the crash of aquamarine waves is almost deafening. Quite often we venture into the New Zealand bush and ogle the mossy trees, the ferns unfurling towards the sun. And always we make faces and smooch at the fantails while they dance down the path before us. Getting lost in the bush never fails to help me push my personal reset button. The melodic call of Tui elevates my spirit, and the rustle of the wood pigeon taking off (most ungracefully) always brings me a moment of startled joy. These are the things that vie for a place in my heart along with the peninsula where cherry blossoms bloom and leaves drip with the deep oranges of autumn. 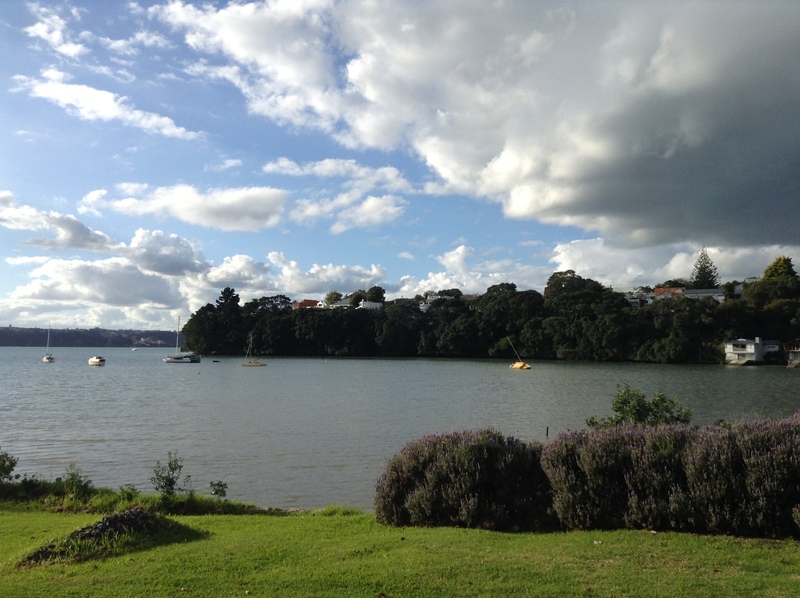 My running route takes me by Cox’s Bay, a lovely little scenic reserve in Auckland. Auckland has grown on me much more than I ever expected. Running through a series of parks and scenic reserves the other day, it struck me how beautiful parts of the city are – especially where the cotton candy clouds meet the skyline; the Skytower a discernible landmark on the horizon; the rolling hills an electric kiwi green and the ocean gently lapping the mangroves. At the moment of writing this, I have no idea what the future holds. By August, though, I will have gone through one of three doors, leading me down distinctly different life paths (more on that later). Keep me, though? As in, forever, ever? Likely not. Loved reading your blog and so pleased you are happy and still enjoying your adventure. Did you have a good visit with Julie? It must have been brilliant for her to have two “local” show her around. So lovely to hear from you! We had a wonderful time with Julia. 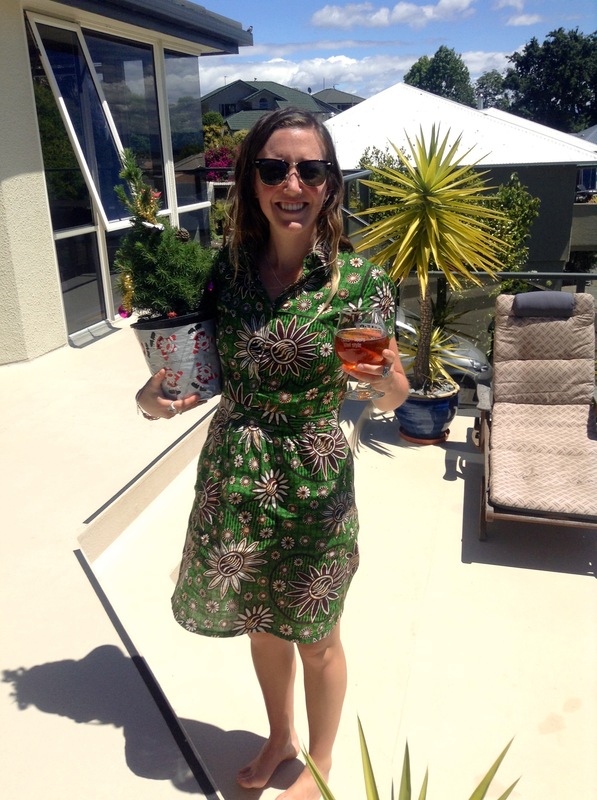 I was fortunate enough to get the night off work and we all went out for Happy Hour and drinks in the city, then Colin took her up north to the Bay of Islands, where they camped and hiked, and got given some fresh snapper by local fishermen. I’d say it was a win all around!